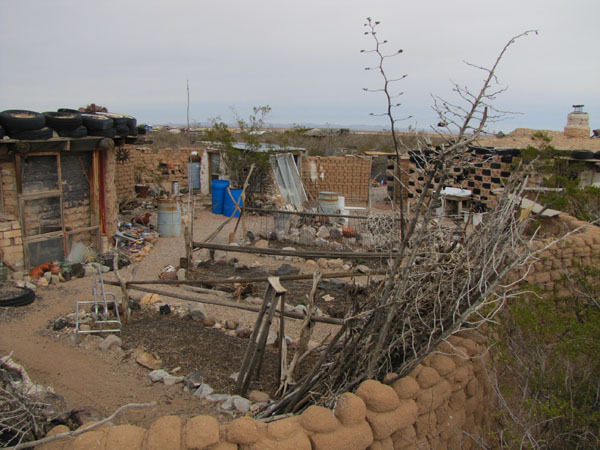 Within the same alternative community as Ted’s ruins (see the previous post) is Sean’s Adobe House, also featured in my Sampler of Alternative Homes video. Sean Sands built this house about 20 years ago for less than $1,000. He used the native soil, which is an almost perfect adobe mix of about 25% clay and 75% sand. All he would do is moist the soil where he wanted to harvest adobe the night before he planned to dig it. 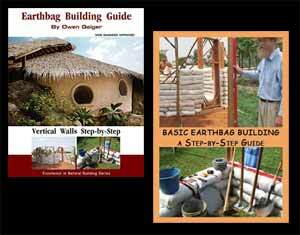 Then he placed the damp soil in a hydraulic ram press to make compressed earth blocks. He would let these cure in the sun for a few days before building with them. Part of the walls of the house were made with old tires packed with soil. 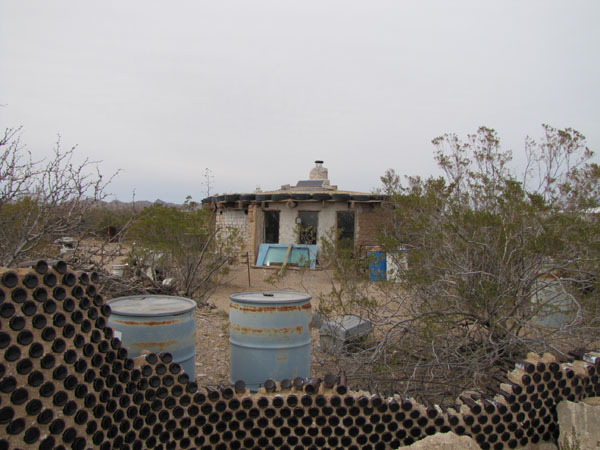 The house was circular, with a central adobe column that supported radiating roof beams. Over these beams were placed smaller branches, a plastic waterproofing membrane, old rugs to protect it, and several inches of soil. In the arid Southwest climate this sufficed to keep the inside dry. Sean employed a simple south-facing Trombe wall with more adobe inside glass panes used as thermal mass for winter heating. During the summer the Trombe wall was obscured to keep it from adding more heat to the house. Sean and his wife created an enclosed courtyard with more adobe walls, as well as a small sleeping room. Several garden beds provided fresh greens most of the year. Sean no longer lives in this house, but others are now enjoying his labors. This is a perfect example of how some ingenuity and hard work can yield a comfortable and inexpensive home. Sean Sand’s house has been one of my favorite ultra low cost houses over the last decade or more. Watch Kelly Hart’s video — A Sampler of Alternative Homes — for details and views of the completed home. Just like Kelly said, Sean’s house is a simple roundhouse made of earth, a central column and radiating rafters. Anyone can build a house like this. And note how the price of dirt hasn’t gone up much lately. Same with wood poles collected from a local forest. That means the cost would still be similar today — about $1,000 for a small roundhouse minus any appliances.